Upon rereading The Bonehunters, I'm going to nudge up my initial rating to 5 stars. Outside of Gardens of the Moon, this is the best installment of a great series (Gardens is my first love - where I came to know "my Malazans" - so it will always hold a particularly fond place in my heart). NOTA BENE & SPOILER ALERT: The notes below assume the reader has read the books so there's a lot of detail I skip over. I'm going to focus on that part of the book that has made it a "5" in my mind even though, as usual, Erikson continues to follow a variety of plotlines and introduces a few new ones (we (and the novels' characters) are finally beginning to see the scope of the coming war with the Crippled God). The bulk of the book is taken up with the forging of the Bonehunters (aka the Malazan Fourteenth Army). It opens a few months after the events in House of Chains. Sha'ik Reborn (aka Felisin Paran) has been killed by the Adjunct, Tavore Paran, her older sister, and the remnants of the Whirlwind army are fleeing to the city-state of Y'Ghatan led by Leoman of the Flails. As an army, the Bonehunters are "shaky." Their victory at Raraku was won by ghosts of the Bridgeburners, and Sha'ik's death was anticlimactic. Morale is low and the competence of the Adjunct as a commander remains in doubt. Unfortunately, Tavore's personality does little to alleviate the problem as she remains cold and aloof even from her commanders. 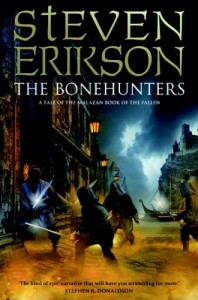 Erikson anchors The Bonehunters around two defining moments in the army's evolution as a fighting force. The first is the siege of Y'Ghatan. This city is a cursed memory to the Malazans for it's here that the First Sword Dassem Ultor was (apparently) killed (actually he escaped both the swords of his Seven Cities' opponents and the Claw assassins sent by Surly (soon to be the Empress) to become the Ascendant known as Traveller). Leoman boobie traps the city with oil so that when the Fourteenth breaches the wall, they ignite a firestorm that consumes the soldiers who had entered the city with the exception of a few who escape into catacombs. Symbolic of a rebirth, these survivors wend their way through the bowels of Y'Ghatan to emerge, naked and with a new sense of identity forged by their ordeal. Meanwhile, the rest of the Fourteenth heads west to escape a plague unleashed in the east by Poliel, the Consort of High House Chains and goddess of disease, and meet up with the Imperial Fleet to return home. This is the first part of the novel. The culmination of the book and the army's second defining moment occurs at Malaz City, where the Adjunct has brought the Bonehunters to confront Laseen. 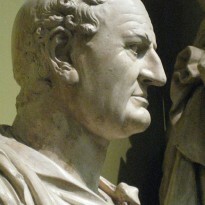 In the aftermath of the Seven Cities rebellion, Mallick Rel and Korbolo Dom - sent back in chains as traitors - have twisted the truth to make it appear that Coltaine and the Wickans conspired with the rebels. On Quon Tali, pogroms have been launched against the Wickans and a virulent xenophobia has gripped the minds of the city's citizens, abetted by sorcerous manipulations of the Mockra warren. In the course of Tavore's return, the Bonehunters have acquired new allies in the guise of the Perish - an army devoted to the new gods of war, Togg and Fanderay. She also learns that the Fourteenth is being forged to be the main army against the Crippled God's legions in the final battle. At Malaz City, Tavore breaks with Laseen and flees the city with the Bonehunters and her new allies. Meanwhile, Korbolo Dom and Mallick Rel assume positions as Laseen's advisors (and the resolution of that will come in Esslemont's Return of the Crimson Guard). Tavore has become one of my favorite characters, ranking up there with Trull, Duiker and Tattersail, and I find myself caring more about the fates of the Fourteenth's soldiers than I do about the characters introduced in the Letherii thread of the series. Both considerations making The Bonehunters my second favorite chapter of the series.